This giveaway has now finished and a Melinda Delmez from the USA is the lucky winner. The a6000 kit + Peak Design Cuff + 64GB memory card is currently making its way to her. Hopefully I’ll be able to run further giveaways in the future. So make sure you keep an eye on this site, the Facebook Page, or subscribe to GAS (if you haven’t already done so) to get a heads-up on any new giveaways, as well as all the latest Sony Alpha news and reviews. 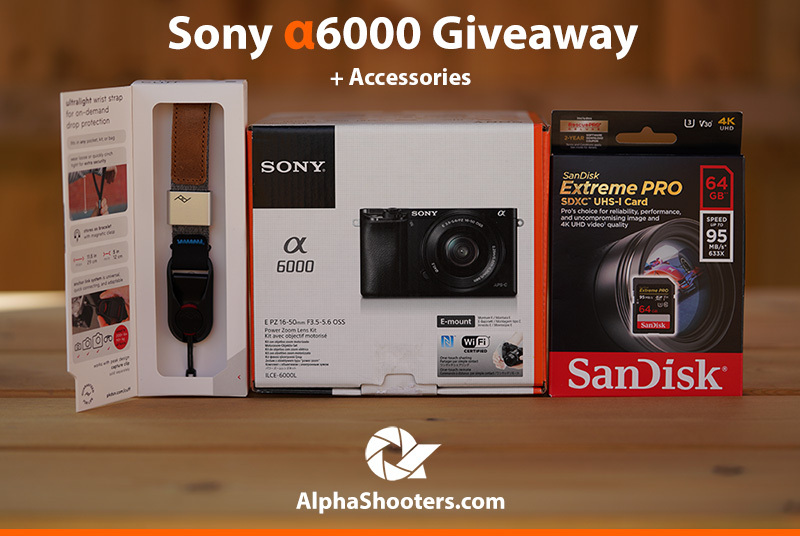 To help promote Alpha Shooters as a growing community and resource for Sony Alpha Shooters, I’m giving away a brand new Sony a6000 with the 16-50mm kit lens, a Peak Design Cuff wrist strap, and a 64GB memory card for free to one lucky winner. The giveaway will start on August 1st, 2018 at 13:30 pm EST and end on August 31st, 2018 at 11:59 pm EST. The giveaway is open worldwide, however certain countries prohibit giveaways/sweepstakes so sadly if you live in one of these countries you will not be eligible to enter, please check the full giveaway terms and conditions below to make sure that you are eligible. Entry is as straight forward as it gets. Simply sign-up to GAS which is my monthly email that features a round-up of all the previous months news, reviews and articles worth reading for Sony Alpha Shooters. No spam. I promise. You can view an example of GAS here. You will need to stay subscribed until September 1st, 2018 at 11:59 pm EST when the winner will be selected, after which you can easily unsubscribe if you wish. After entering your email below you will receive a confirmation email. You will need to click the link in this email to confirm that you really want to receive emails from me in order to be added to the list and be eligible to win. This promotion is not sponsored, endorsed or administered by, or associated with Sony in anyway. Please read these terms and conditions in full to ensure that you are eligible to win. The giveaway is open worldwide to those that are age 18 or older. The giveaway is however prohibited in Canada, France, Sweden, Taiwan and any other country that bans the practice of “Giveaways/Sweepstakes”. Participation in the giveaway constitutes the entrant’s full and unconditional agreement to and acceptance of these official rules. Entrants must be able to receive prizes via direct mail address and not a PO box to be eligible to win. The giveaway will start on August 1st, 2018 at 13:30 pm EST and end on August 31st, 2018 at 11:59 pm EST. The winner will be chosen on September 1st, 2018. The winner will be contacted via the email used to enter. If the winner does not claim their prize within 7 days, another winner will be randomly selected. Entrants must sign-up to my GAS monthly email using the form above or on my GAS or Join pages. Entry is limited to one email per person. After entering your email you will receive a confirmation email. You will need to click the link in this email to confirm that you really want to receive emails from me in order to be added to the list and be eligible to win. If you are already a member of GAS then you don’t need to do anything. GAS members are automatically entered into the giveaway, but you will still need to meet the eligibility requirements set out in the giveaway terms and conditions if you are chosen as the winner. The prize on offer is a brand new Sony a6000 digital camera with the Sony 16-50mm kit lens, a Peak Design Cuff wrist strap, and a 64GB Sandisk memory card. The total value of the prize as purchased is £552.94 UK Pounds. The odds of winning will depend on the total number of eligible entries received. The camera box will be opened by myself just to check that it works correctly before shipping to the winner. No cash or other substitution of the prize is permitted. The sponsor will not replace any lost or stolen prizes. Since the prize has been purchased in the UK, it will include a UK and European power plug for the included charger. If the winner is located in any other country, you will need to supply your own power adapter. The warranty included covers Europe only. The sponsor will not be responsible for repairs or warranty claims. All email entries who meet the requirements of these official rules will be entered into a spreadsheet and assigned number. The winner will then be selected at random using the website www.random.org. Winners are solely responsible for any and all federal, state, provincial and local taxes or import duties that apply to prizes. The winner will be announced here on the Alpha Shooters website, Facebook Page and Twitter accounts. You can also contact me directly to ask for the winners name. Except where prohibited by law, by accepting the prize, the winner consents to the use of his/her name when they are announced as the winner on this website and related social media accounts. No additional compensation will be provided for this. Please allow 1-2 weeks for delivery of the prize. I’m sponsoring the giveaway myself. Timothy Mayo, Alpis Media Limited, Bank Street Business Centre, 6 Bank Street, Malvern, Worcestershire, WR14 2JN, England.